Peaches are in season, so we picked up a basket at the grocery store this morning. 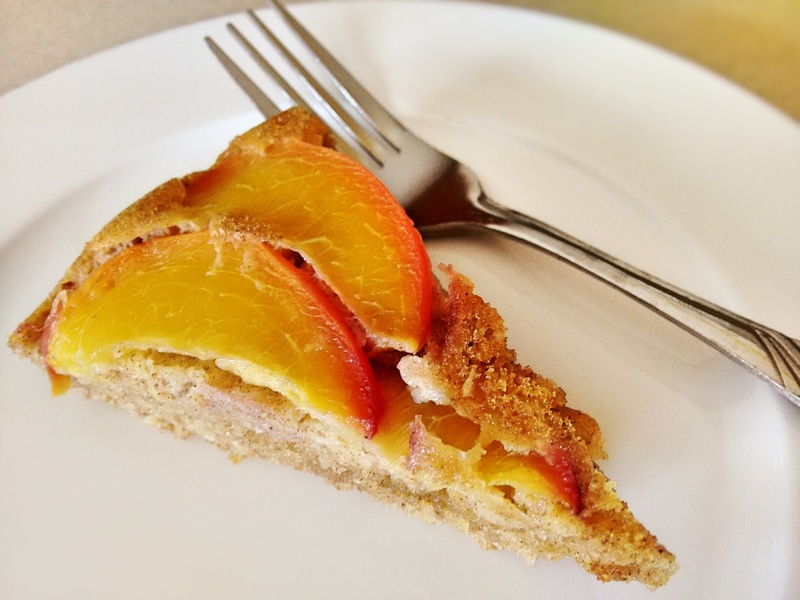 Almond flour makes a great pairing with peaches. Almonds and peaches come from the same family of plants called Prunus (the seed inside the peach looks very similar to an almond too). Almond flour works well for an upside down cake because it tends not to rise, so it will stay flat. This cake can be served warm with a scoop of vanilla ice cream, or enjoy it with a cup of tea! Preheat oven to 350°F. Grease a 9 inch glass pie dish. Layer peach slices in the bottom of the pie dish. In a large bowl, combine ground almonds, flour, baking powder, salt and cinnamon. In a second bowl, combine brown sugar, coconut oil and applesauce, then mash together with a fork. In a third bowl, whisk eggs until frothy, then mix in vanilla extract. Pour wet ingredients from both bowls into dry, mix, then pour over peaches and spread out evenly in pie dish. Bake for 20 minutes, allow to cool for about 3 minutes, then run a knife along the rim of the cake. Flip the cake over onto a cooling rack so peaches are on top.